There are 61 publications for Fiscal policy. Although the ongoing recovery is about to become the longest in the history of the United States, it is also the weakest in postwar history, and as we enter the second quarter of 2019, many clouds have gathered. This Strategic Analysis considers the recent trajectory, the present state, and the future prospects of the US economy. The authors identify four main structural problems that explain how we arrived at the crisis of 2007–09 and why the recovery that has followed has been so weak—as well as why the prospect of a recession is increasingly likely. The US economy is in need of deep structural reforms that will deal with these problems. This report analyzes a pair of policies that begin to move in that direction, both involving an increase in the tax rate for high-income and high-net-worth households. Even if the primary justification for these policies is not economic, this report shows that if such an increase in taxes is accompanied by an equivalent increase in government outlays, the redistributive impact will have a positive macroeconomic effect while moving the US economy toward a more sustainable future. Gender budgeting is a fiscal approach that seeks to use a country’s national and/or local budget(s) to reduce inequality and promote economic growth and equitable development. While the literature has explored the connection between reducing gender inequality and achieving growth and equitable development, more empirical analysis is needed on whether gender budgeting reduces gender inequality. Our study follows the methodology of Stotsky and Zaman (2016) to investigate the impact of gender budgeting on promoting gender equality across Asia Pacific countries. The study classifies Asia Pacific countries as gender budgeting or non-gender budgeting according to whether they have formalized gender budgeting initiatives in laws and/or budget call circulars. To measure the effect of gender budgeting on reducing inequality, we measure the correlation between gender budgeting and the Gender Development Index (GDI) and the Gender Inequality Index (GII) scores in each country. The data for our gender inequality variables are mainly drawn from the IMF database on gender indicators and the World Development Indicators database over the 1990–2013 period. Our results show that gender budgeting has a significant effect on increasing the GDI and a small but significant potential to reduce the GII, strengthening the rationale for employing gender budgeting to promote inclusive development. However, our empirical results show no prioritization of gender budgeting in the fiscal space of health and education sectors in the region. In November 1987, Hyman Minsky visited Bogotá, Colombia, after being invited by a group of professors who at that time were interested in post-Keynesian economics. There, Minsky delivered some lectures, and Lauchlin Currie attended two of those lectures at the National University of Colombia. Although Currie is not as well-known as Minsky in the American academy, both are outstanding figures in the development of non-orthodox approaches to monetary economics. Both alumni of the economics Ph.D. program at Harvard had a debate in Bogotá. Unfortunately, there are no formal records of this, so here a question arises: What could have been their respective positions? The aim of this paper is to discuss Currie’s and Minsky’s perspectives on monetary economics and to speculate on what might have been said during their debate. The US economy has been expanding continuously for almost nine years, making the current recovery the second longest in postwar history. However, the current recovery is also the slowest recovery of the postwar period. This Strategic Analysis presents the medium-run prospects, challenges, and contradictions for the US economy using the Levy Institute’s stock-flow consistent macroeconometric model. By comparing a baseline projection for 2018–21 in which no budget or tax changes take place to three additional scenarios, the authors isolate the likely macroeconomic impacts of: (1) the recently passed tax bill; (2) a large-scale public infrastructure plan of the same “fiscal size” as the tax cuts; and (3) the spending increases entailed by the Bipartisan Budget Act and omnibus bill. Finally, Nikiforos and Zezza update their estimates of the likely outcome of a scenario in which there is a sharp drop in the stock market that induces another round of private-sector deleveraging. Although in the near term the US economy could see an acceleration of its GDP growth rate due to the recently approved increase in federal spending and the new tax law, it is increasingly likely that the recovery will be derailed by a crisis that will originate in the financial sector. The paper attempts to measure the incidence of corporate income tax in India under a general equilibrium setting. Using seemingly uncorrelated regression coefficients and dynamic panel estimates, we tried to analyze both the relative burden of corporate tax borne by capital and labor and the efficiency effects of corporate income tax. The data for the study is compiled from corporate firms listed on the Bombay Stock Exchange (BSE) and the National Stock Exchange of India (NSE) for the period 2000–15. Our empirical estimates suggest that in India capital bears more of the burden of corporate taxes than labor. Though it is contrary to the Harberger (1962) hypothesis that the burden of corporate tax is shifted to labor rather than capital, it confirms the existing empirical results in the context of India. If the Trump administration is to fulfill its campaign promises to this age’s “forgotten” men and women, Director of Research Jan Kregel argues, it should embrace the broader lesson of the 1930s: that government regulation and fiscal policy are crucial in addressing changes in the economic and financial structure that have exacerbated the problems faced by struggling communities. In this policy note, Kregel explains how overcoming the economic and financial challenges we face today, just as in the 1930s, requires avoiding what Walter Lippmann identified as an “obvious error”: the blind belief that reducing regulation and the role of government will somehow restore a laissez-faire market liberalism that never existed and is inappropriate to the changing structure of production of both the US and the global economy. Since the 1980s, economic recoveries in the United States have been delivering the vast majority of income growth to the wealthiest households. This policy note updates the analysis in One-Pager No. 47 and Policy Note 2015/4 with the latest data through 2015, looking at the distribution of average income growth (with and without capital gains) between the bottom 90 percent and top 10 percent of households, and between the bottom 99 percent and top 1 percent of households. Little has changed when considering the distribution of average income growth in the current recovery (up to 2015) between the bottom 90 percent and top 10 percent of families, with or without capital gains. Although average real income for the bottom 90 percent of households is no longer shrinking, these families still capture a historically small proportion of that growth—only between 18 percent and 22 percent. The growing economy continues to deliver the most benefits to the wealthiest families. This paper analyzes the effectiveness of public expenditures on economic growth within the analytical framework of comprehensive Neo-Schumpeterian economics. Using a fixed-effects model for G20 countries, the paper investigates the links between the specific categories of public expenditures and economic growth, captured in human capital formation, defense, infrastructure development, and technological innovation. The results reveal that the impact of innovation-related spending on economic growth is much higher than that of the other macro variables. Data for the study was drawn from the International Monetary Fund’s Government Finance Statistics database, infrastructure reports for the G20 countries, and the World Development Indicators issued by the World Bank. Since inheriting the Brazilian presidency five months ago, the new Temer administration has successfully ratified a constitutional amendment imposing a radical, two-decades-long public spending freeze, purportedly aimed at sparking an increase in business confidence and investment. In this policy brief, Fernando Cardim de Carvalho explains why this fiscal strategy is based not only on a flawed conception of the drivers of private-sector confidence and investment but also on a mistaken view of the roots of the current Brazilian economic crisis. The hoped-for “expansionary fiscal consolidation” is not likely to be achieved. This paper provides a critical analysis of expansionary austerity theory (EAT). The focus is on the theoretical weaknesses of EAT—the extreme circumstances and fragile assumptions under which expansionary consolidations might actually take place. The paper presents a simple theoretical model that takes inspiration from both the post-Keynesian and evolutionary/institutionalist traditions. First, it demonstrates that well-designed austerity measures hardly trigger short-run economic expansions in the context of expected long-lasting consolidation plans (i.e., when adjustment plans deal with remarkably high debt-to-GDP ratios), when the so-called “financial channel” is not operative (i.e., in the context of monetarily sovereign economies), or when the degree of export responsiveness to internal devaluation is low. Even in the context of non–monetarily sovereign countries (e.g., members of the eurozone), austerity’s effectiveness crucially depends on its highly disputable capacity to immediately stabilize fiscal variables. The paper then analyzes some possible long-run economic dynamics, emphasizing the high degree of instability that characterizes austerity-based adjustments plans. Path-dependency and cumulativeness make the short-run impulse effects of fiscal consolidation of paramount importance to (hopefully) obtaining any appreciable medium-to-long-run benefit. Should these effects be contractionary at the onset, the short-run costs of austerity measures can breed an endless spiral of recession and ballooning debt in the long run. If so, in the case of non–monetarily sovereign countries debt forgiveness may emerge as the ultimate solution to restore economic soundness. Alternatively, institutional innovations like those adopted since mid-2012 by the European Central Bank are required to stabilize the economy, even though they are unlikely to restore rapid growth in the absence of more active fiscal stimuli. We describe the production of estimates of the Levy Institute Measure of Time and Income Poverty (LIMTIP) for Buenos Aires, Argentina, and use it to analyze the incidence of time and income poverty. We find high numbers of hidden poor—those who are not poor according to the official measure but are found to be poor when using our time-adjusted poverty line. Large time deficits for those living just above the official poverty line are the reason for this hidden poverty. Time deficits are unevenly distributed by employment status, family type, and especially gender. Simulations of the impact of full-time employment on those households with nonworking (for pay) adults indicate that reductions in income poverty can be achieved, but at the cost of increased time poverty. Policy interventions that address the lack of both income and time are discussed. Brazil is mired in a joint economic and political crisis, and the way out is unclear. In 2015 the country experienced a steep contraction of output alongside elevated inflation, all while the fallout from a series of corruption scandals left the policymaking apparatus paralyzed. Looking ahead, implementing a policy strategy that has any hope of addressing the Brazilian economy’s multilayered problems would make serious demands on a political system that is most likely unable to bear it. To the extent that policymakers have learned anything at all from the Great Depression and the policy responses of the 1930s, the lessons appear to have been the wrong ones. In this public policy brief, Director of Research Jan Kregel explains why there is still a great deal we have to learn from the New Deal. He illuminates one of the New Deal’s principal objectives—quelling the fear and uncertainty of mass unemployment—and the pragmatic, experimental process through which the tool for achieving this objective—directed government expenditure—came to be embraced. In the search for a blueprint from the 1930s, Kregel suggests that too much attention has been paid to the measures deployed to shore up the banking system, and that the approaches underlying the emergency financial policy measures of the recent period and those of the 1930s were actually quite similar. The more meaningful divergence between the 1930s and the post-2008 policy response, he argues, can be uncovered by comparing the actions that were taken (or not taken, as the case may be) to address the real sector of the economy following the resolution of the respective financial crises. Historically high levels of private and public debt coupled with already very low short-term interest rates appear to limit the options for stimulative monetary policy in many advanced economies today. One option that has not yet been considered is monetary financing by central banks to boost demand and/or relieve debt burdens. We find little empirical evidence to support the standard objection to such policies: that they will lead to uncontrollable inflation. Theoretical models of inflationary monetary financing rest upon inaccurate conceptions of the modern endogenous money creation process. This paper presents a counter-example in the activities of the Bank of Canada during the period 1935–75, when, working with the government, it engaged in significant direct or indirect monetary financing to support fiscal expansion, economic growth, and industrialization. An institutional case study of the period, complemented by a general-to-specific econometric analysis, finds no support for a relationship between monetary financing and inflation. The findings lend support to recent calls for explicit monetary financing to boost highly indebted economies and a more general rethink of the dominant New Macroeconomic Consensus policy framework that prohibits monetary financing. Is a Very High Public Debt a Problem? This paper has two main objectives. The first is to propose a policy architecture that can prevent a very high public debt from resulting in a high tax burden, a government default, or inflation. The second objective is to show that government deficits do not face a financing problem. After these deficits are initially financed through the net creation of base money, the private sector necessarily realizes savings, in the form of either government bond purchases or, if a default is feared, “acquisitions” of new money. We hope to model financial fragility and money in a way that captures much of what is crucial in Hyman Minsky’s financial fragility hypothesis. This approach to modeling Minsky may be unique in the formal Minskyan literature. Namely, we adopt a model in which a psychological variable we call financial prudence (P) declines over time following a financial crash, driving a cyclical buildup of leverage in household balance sheets. High leverage or a low safe-asset ratio in turn induces high financial fragility (FF). In turn, the pathways of FF and capacity utilization (u) determine the probabilistic risk of a crash in any time interval. When they occur, these crashes entail discrete downward jumps in stock prices and financial sector assets and liabilities. To the endogenous government liabilities in Hannsgen (2014), we add common stock and bank loans and deposits. In two alternative versions of the wage-price module in the model (wage–Phillips curve and chartalist, respectively), the rate of wage inflation depends on either unemployment or the wage-setting policies of the government sector. At any given time t, goods prices also depend on endogenous markup and labor productivity variables. Goods inflation affects aggregate demand through its impact on the value of assets and debts. Bank rates depend on an endogenous markup of their own. Furthermore, in light of the limited carbon budget of humankind over a 50-year horizon, goods production in this model consumes fossil fuels and generates greenhouse gases. The government produces at a rate given by a reaction function that pulls government activity toward levels prescribed by a fiscal policy rule. Subcategories of government spending affect the pace of technical progress and prudence in lending practices. The intended ultimate purpose of the model is to examine the effects of fiscal policy reaction functions, including one with dual unemployment rate and public production targets, testing their effects on numerically computed solution pathways. Analytical results in the penultimate section show that (1) the model has no equilibrium (steady state) for reasons related to Minsky’s argument that modern capitalist economies possess a property that he called “the instability of stability,” and (2) solution pathways exist and are unique, given vectors of initial conditions and parameter values and realizations of the Poisson model of financial crises. In the postwar period, with every subsequent expansion, a smaller and smaller share of the gains in income growth have gone to the bottom 90 percent of families. Worse, in the latest expansion, while the economy has grown and average real income has recovered from its 2008 lows, all of the growth has gone to the wealthiest 10 percent of families, and the income of the bottom 90 percent has fallen. Most Americans have not felt that they have been part of the expansion. We have reached a situation where a rising tide sinks most boats. This policy note provides a broader overview of the increasingly unequal distribution of income growth during expansions, examines some of the changes that occurred from 2012 to 2013, and identifies a disturbing business cycle trend. It also suggests that policy must go beyond the tax system if we are serious about reversing the drastic worsening of income inequality. This paper examines the emerging challenges to the art of monetary policymaking using the case study of the Reserve Bank of India (RBI) in light of developments in the Indian economy during the last decade (2003–04 to 2013–14). The paper uses Hyman P. Minsky’s financial instability hypothesis as the conceptual framework for evaluating the endogenous nature of financial instability and its potential impact on monetary policymaking, and addresses the need to pursue regulatory policy as a tool that is complementary to monetary policy in light of the agenda of reforms put forward by Minsky. It further reviews the extensions to the Minskyan hypothesis in the areas of setting fiscal policy, managing cross-border capital flows, and developing financial institutional infrastructure. The lessons learned from the interplay of policy choices in these areas and their impact on monetary policymaking at the RBI are presented. In the postwar period, income growth has become more inequitably distributed with virtually every subsequent economic expansion. From 2009 to 2012, while the economy was recovering from one of the biggest economic downturns in recent memory, the top 1 percent took home 95 percent of the income gains. To reverse this pattern, Research Associate Pavlina R. Tcherneva recommends policy strategies to promote growth from the bottom up—to change the income distribution directly by funding employment opportunities in the public, nonprofit, or social entrepreneurial sector. What are the prospects for economic recovery if Greece continues to follow the troika strategy of fiscal austerity and internal devaluation, with the aim of increasing competitiveness and thus net exports? Our latest strategic analysis indicates that the unprecedented decline in real and nominal wages may take a long time to exert its effects on trade—if at all—while the impact of lower prices on tourism will not generate sufficient revenue from abroad to meet the targets for a surplus in the current account that outweighs fiscal austerity. The bottom line: a shift in the fiscal policy stance, toward lower taxation and job creation, is urgently needed. Contrary to German chancellor Angela Merkel’s recent claim, the euro crisis is not nearly over but remains unresolved, leaving the eurozone extraordinarily vulnerable to renewed stresses. In fact, as the reforms agreed to so far have failed to turn the flawed and dysfunctional euro regime into a viable one, the current calm in financial markets is deceiving, and unlikely to last. The euro regime’s essential flaw and ultimate source of vulnerability is the decoupling of central bank and treasury institutions in the euro currency union. In this public policy brief, Research Associate Jörg Bibow proposes a Euro Treasury scheme to properly fix the regime and resolve the euro crisis. The Euro Treasury would establish the treasury–central bank axis of power that exists at the center of control in sovereign states. Since the eurozone is not actually a sovereign state, the proposed treasury is specifically designed not to be a transfer union; no mutualization of existing national public debts is involved either. The Euro Treasury would be the means to pool future eurozone public investment spending, funded by proper eurozone treasury securities, and benefits and contributions would be shared across the currency union based on members’ GDP shares. The Euro Treasury would not only heal the euro’s potentially fatal birth defects but also provide the needed stimulus to end the crisis in the eurozone. For Economic Stimulus, or for Austerity and Volatility? The implementation of economic reforms under new economic policies in India was associated with a paradigmatic shift in monetary and fiscal policy. While monetary policies were solely aimed at “price stability” in the neoliberal regime, fiscal policies were characterized by the objective of maintaining “sound finance” and “austerity.” Such monetarist principles and measures have also loomed over the global recession. This paper highlights the theoretical fallacies of monetarism and analyzes the consequences of such policy measures in India, particularly during the period of the global recession. Not only did such policies pose constraints on the recovery of output and employment, with adverse impacts on income distribution; but they also failed to achieve their stated goal in terms of price stability. By citing examples from southern Europe and India, this paper concludes that such monetarist policy measures have been responsible for stagnation, with a rise in price volatility and macroeconomic instability in the midst of the global recession. How Poor Is Turkey? And What Can Be Done About It? Gauging the severity of poverty in a given country requires a reasonably comprehensive measurement of whether individuals and households are surpassing some basic threshold of material well-being. This would seem to be an obvious point, and yet, in most cases, our official poverty metrics fail that test, often due to a crucial omission. In this policy brief, Senior Scholar Ajit Zacharias, Research Scholar Thomas Masterson, and Research Associate Emel Memiş present an alternative measure of poverty for Turkey and lay out the policy lessons that follow. Their research reveals that the number of people living in poverty and the severity of their deprivation have been significantly underestimated. This report is part of an ongoing Levy Institute project on time poverty (the Levy Institute Measure of Time and Income Poverty), which has produced research on Latin America, Korea, and now Turkey, with the aim of extending this approach to other countries. Official poverty lines in Turkey and other countries often ignore the fact that unpaid household production activities that contribute to the fulfillment of material needs and wants are essential for the household to reproduce itself as a unit. This omission has consequences. Taking household production for granted when measuring poverty yields an unacceptably incomplete picture, and therefore estimates based on such an omission provide inadequate guidance to policymakers. Standard measurements of poverty assume that all households and individuals have enough time to adequately attend to the needs of household members—including, for example, children. These tasks are absolutely necessary for attaining a minimum standard of living. But this assumption is false. For numerous reasons, some households may not have sufficient time, and they thus experience what are referred to as “time deficits.” If a household officially classified as nonpoor has a time deficit and cannot afford to cover it by buying market substitutes (e.g., hire a care provider), that household will encounter hardships not reflected in the official poverty measure. To get a more accurate calculus of poverty, we have developed the Levy Institute Measure of Time and Consumption Poverty (LIMTCP), a two-dimensional measure that takes into account both the necessary consumption expenditures and household production time needed to achieve a minimum living standard. 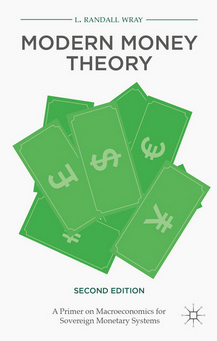 One of the main contributions of Modern Money Theory (MMT) has been to explain why monetarily sovereign governments have a very flexible policy space that is unconstrained by hard financial limits. Not only can they issue their own currency to pay public debt denominated in their own currency, but they can also easily bypass any self-imposed constraint on budgetary operations. Through a detailed analysis of the institutions and practices surrounding the fiscal and monetary operations of the treasury and central bank of the United States, the eurozone, and Australia, MMT has provided institutional and theoretical insights into the inner workings of economies with monetarily sovereign and nonsovereign governments. The paper shows that the previous theoretical conclusions of MMT can be illustrated by providing further evidence of the interconnectedness of the treasury and the central bank in the United States. In 1943, Congress faced unpredictably large war expenditures exceeding the prevailing debt limit. Congressional debates from that time contain an insightful discussion of how the increased expenditures could be financed, dealing with practical and theoretical issues that seem to be missing from current debates. In the '43 debate, Representative Wright Patman proposed that the Treasury should create a nonnegotiable zero interest bond that would be placed directly with the Federal Reserve Banks. As the deadline for raising the US federal government debt limit approaches, Senior Scholar Jan Kregel examines the implications of Patman's proposal. Among the lessons: that the debt can be financed at any rate the government desires without losing control over interest rates as a tool of monetary policy. The problem of financing the debt is not the issue. The question is whether the size of the deficit to be financed is compatible with the stable expansion of the economy. The job guarantee is a proposal that provides greater macroeconomic stability and secures a fundamental human right. Despite the economic and moral merits of this policy, often the program is rejected because of concerns about its administration. How would the program be implemented? Who will create the jobs? Can work be found for every unemployed individual who wishes to work? This policy note addresses these concerns by elaborating on a proposal for the United States that would run the job guarantee through the social enterprise sector, which includes traditional nonprofit organizations and emerging nonprofit social entrepreneurial ventures. Since adopting a policy of gradually opening its economy more than three decades ago, China has enjoyed rapid economic growth and rising living standards for much of its population. While some argue that China might fall into the middle-income “trap,” they are underestimating the country’s ability to continue to grow at a rapid pace. It is likely that China’s growth will eventually slow, but the nation will continue on its path to join the developed high-income group—so long as the central government recognizes and uses the policy space available to it. The German debt brake is often regarded as a great success story, and has therefore served as a role model for the Euro area and its fiscal compact. In this paper we fundamentally criticize the debt brake. We show that (1) it suffers from serious shortcomings, and its success is far from certain even from a mainstream point of view; (2) from a Post-Keynesian perspective, it completely neglects the requirements for fiscal policies of member-countries in a currency union and will prevent fiscal policy from contributing to the necessary rebalancing in the Euro area; and (3) alternative scenarios, which could avoid the deflationary pressures of the German debt brake on domestic demand and contribute to internally rebalancing the Euro area, are extremely unlikely, as they would have to rely on unrealistic shifts in the functional income distribution and/or investment and savings behavior in Germany. The present paper offers a fundamental critique of fiscal policy as it is understood in theory and exercised in practice. Two specific demand-side stabilization methods are examined here: conventional pump priming and the new designation of fiscal policy effectiveness found in the New Consensus literature. A theoretical critique of their respective transmission mechanisms reveals that they operate in a trickle-down fashion that not only fails to secure and maintain full employment but also contributes to the increasing postwar labor market precariousness and the erosion of income equality. The two conventional demand-side measures are then contrasted with the proposed alternative—a bottom-up approach to fiscal policy based on a reinterpretation of Keynes’s original policy prescriptions for full employment. The paper offers a theoretical, methodological, and policy rationale for government intervention that includes specific direct-employment and investment initiatives, which are inherently different from contemporary hydraulic fine-tuning measures. It outlines the contours of the modern bottom-up approach and concludes with some of its advantages over conventional stabilization methods. Is the Link between Output and Jobs Broken? As this report goes to press, the official unemployment rate remains tragically elevated, compared even to rates at similar points in previous recoveries. The US economy seems once again to be in a “jobless recovery,” though the unemployment rate has been steadily declining for years. At the same time, fiscal austerity has arrived, with the implementation of the sequester cuts, following tax increases and the ending of emergency extended unemployment benefits just two months ago. Our new report provides medium-term projections of employment and economic growth under four different scenarios. The baseline scenario starts by assuming the same growth rates and government deficits as the Congressional Budget Office’s (CBO) baseline projection from earlier this year. The result is a new surge of the unemployment rate to nearly 8 percent in the third quarter of this year, followed by a very gradual new recovery. Scenarios 1 and 2 seek to reach unemployment-rate goals of 6.5 percent and 5.5 percent, respectively, by the end of next year, using new fiscal stimulus. We find in these simulations that reaching the goals requires large amounts of fiscal stimulus, compared to the CBO baseline. For example, in order to reach 5.5 percent unemployment in 2014, scenario 2 assumes 11 percent growth in inflation-adjusted government spending and transfers, along with lower taxes. As an alternative, scenario 3 adds an extra increase to growth abroad and to private borrowing, along with the same amount of fiscal stimulus as in scenario 1. 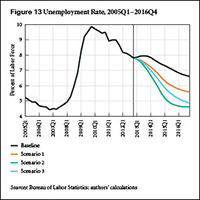 In this last scenario of the report, the unemployment rate finally pierces the 5.5 percent threshold from the previous scenario in the third quarter of 2015. We conclude with some thoughts about how such an increase in demand from all three sectors—government, private, and external—might be realistically obtained. The 1951 Treasury – Federal Reserve Accord is an important milestone in central bank history. It led to a lasting separation between monetary policy and the Treasury’s debt-management powers, and established an independent central bank focused on price stability and macroeconomic stability. This paper revisits the history of the Accord and elaborates on the role played by Marriner Eccles in the events that led up to its signing. As chairman of the Fed Board of Governors since 1934, Eccles was also instrumental in drafting key banking legislation that enabled the Federal Reserve System to take on a more independent role after the Accord. The global financial crisis has generated renewed interest in the Accord and its lessons for central bank independence. The paper shows that Eccles’s support for the Accord—and central bank independence—was clearly linked to the strong inflationary pressures in the US economy at the time, but that he was as supportive of deficit financing in the 1930s. This broader interpretation of the Accord holds the key to a more balanced view of Eccles’s role at the Federal Reserve, where his contributions from the mid-1930s up to the Accord are seen as equally important. For this reason, the Accord should not be seen as the eternal beacon for central bank independence but rather as an enlightened vision for a more symmetric policy role for central banks, with equal weight on fighting inflation and preventing depressions. Financial market crises with the threat of a subsequent debt-deflation depression have occurred with increasing regularity in the United States from 1980 through the present. Almost reflexively, when confronted with such circumstances, US institutions and the policymakers that run them have responded in a fashion that has consistently thwarted debt-deflation-depression dynamics. It is true that these “remedies,” as they succeeded, increasingly contributed to a moral hazard in US and global financial markets that culminated with the crisis that began in 2007. Nonetheless, the straightforward steps taken by established institutions enabled the United States to derail depression dynamics, while European 1930s-style austerity proved as ineffective as it was almost a century ago. Europe’s, and specifically Germany’s, steadfast refusal to embrace the US recipe has fostered mushrooming economic hardship on the continent. The situation is gruesome, and any serious student of economic history had to have known, given European policy commitments, that it was destined to turn out this way. It is easy to understand why misguided policies drove initial European responses. Economic theory has frowned on Keynes. Economic successes, especially in Germany, offered up the wrong lessons, and enduring angst about inflation was a major distraction. At the outset, the wrong medicine for the wrong disease was to be expected. What is much harder to fathom is why such a poisonous elixir continues to be proffered amid widespread evidence that the patient is dying. Deconstructing cognitive dissonance in other spheres provides an explanation. Not surprisingly, knowing what one wants to happen at home completely informs one’s claims concerning what will be good for one’s neighbors. In such a construct, the last best hope for Europe is ECB President Mario Draghi. He seems to be able to speak German and yet act European. This paper argues that the usual framing of discussions of money, monetary policy, and fiscal policy plays into the hands of conservatives.That framing is also largely consistent with the conventional view of the economy and of society more generally. To put it the way that economists usually do, money “lubricates” the market mechanism—a good thing, because the conventional view of the market itself is overwhelmingly positive. Acknowledging the work of George Lakoff, this paper takes the position that we need an alternative meme, one that provides a frame that is consistent with a progressive social view if we are to be more successful in policy debates. In most cases, the progressives adopt the conservative framing and so have no chance. The paper advances an alternative framing for money and shows how it can be used to reshape discussion. The paper shows that the Modern Money Theory approach is particularly useful as a starting point for framing that emphasizes use of the monetary system as a tool to accomplish the public purpose. It is not so much the accuracy of the conventional view of money that we need to question, but rather the framing. We need a new meme for money, one that would emphasize the social, not the individual. It would focus on the positive role played by the state, not only in the creation and evolution of money, but also in ensuring social control over money. It would explain how money helps to promote a positive relation between citizens and the state, simultaneously promoting shared values such as liberty, democracy, and responsibility. It would explain why social control over money can promote nurturing activities over the destructive impulses of our “undertakers” (Smith’s evocative term for capitalists). Recently, some have wondered whether a fiscal stimulus plan could reduce the government’s budget deficit. Many also worry that fiscal austerity plans will only bring higher deficits. Issues of this kind involve endogenous changes in tax revenues that occur when output, real wages, and other variables are affected by changes in policy. Few would disagree that various paradoxes of austerity or stimulus might be relevant, but such issues can be clarified a great deal with the help of a complete heterodox model. In light of recent world events, this paper seeks to improve our understanding of the dynamics of fiscal policy and financial crises within the context of two-dimensional (2D) and five-dimensional heterodox models. The nonlinear version of the 2D model incorporates curvilinear functions for investment and consumption out of unearned income. To bring in fiscal policy, I make use of a rule with either (1) dual targets of capacity utilization and public production, or (2) a balanced-budget target. Next, I add discrete jumps and policy-regime switches to the model in order to tell a story of a financial crisis followed by a move to fiscal austerity. Then, I return to the earlier model and add three more variables and equations: (1) I model the size of the private- and public-sector labor forces using a constant growth rate and account for their social reproduction by introducing an unemployment-insurance scheme; and (2) I make the markup endogenous, allowing its rate of change to depend, in a possibly nonlinear way, on capacity utilization, the real wage relative to a fixed norm, the employment rate, profitability, and the business sector’s desired capital-stock growth rate. In the conclusion, I comment on the implications of my results for various policy issues. The paper evaluates the fiscal policy initiatives during the Great Recession in the United States. It argues that, although the nonconventional fiscal policies targeted at the financial sector dwarfed the conventional countercyclical stabilization efforts directed toward the real sector, the relatively disappointing impact on employment was a result of misdirected funding priorities combined with an exclusive and ill-advised focus on the output gap rather than on the employment gap. The paper argues further that conventional pump-priming policies are incapable of closing this employment gap. In order to tackle the formidable labor market challenges observed in the United States over the last few decades, policy could benefit from a fundamental reorientation away from trickle-down Keynesianism and toward what is termed here a “bottom-up approach” to fiscal policy. This approach also reconsiders the nature of countercyclical government stabilizers. The conventional approach of fiscal policy is to create jobs by boosting private investment and growth. This approach is backward, says Research Associate Pavlina R. Tcherneva. Policy must begin by fixing the unemployment situation because growth is a byproduct of strong employment—not the other way around. Tcherneva proposes a bottom-up approach based on community programs that can be implemented at all phases of the business cycle; that is, a grass-roots job-guarantee program run by the nonprofit sector (with participation by the social entrepreneurial sector) but financed by the government. A job-guarantee program would lead to full employment over the long run and address an outstanding fault of modern market economies. Not since the Great Depression have monetary policy matters and institutions weighed so heavily in commercial, financial, and political arenas. Apart from the eurozone crisis and global monetary policy issues, for nearly two years all else has counted for little more than noise on a relative risk basis. In major developed economies, a hypermature secular decline in interest rates is pancaking against a hard, roughly zero lower-rate bound (i.e., barring imposition of rather extreme policies such as a tax on cash holdings, which could conceivably drive rates deeply negative). Relentlessly mounting aggregate debt loads are rendering monetary- and fiscal policy–impaired governments and segments of society insolvent and struggling to escape liquidity quicksands and stubbornly low or negative growth and employment trends. At the center of the current crisis is the European Monetary Union (EMU)—a monetary union lacking fiscal and political integration. Such partial integration limits policy alternatives relative to either full federal integration of member-states or no integration at all. As we have witnessed since spring 2008, this operationally constrained middle ground progressively magnifies economic divergence and political and social discord across member-states. Given the scale and scope of the eurozone crisis, policy and actions taken (or not taken) by the European Central Bank (ECB) meaningfully impact markets large and small, and ripple with force through every major monetary policy domain. History, for the moment, has rendered the ECB the world’s most important monetary policy pivot point. Since November 2011, the ECB has taken on an arguably activist liquidity-provider role relative to private banks (and, in some important measure, indirectly to sovereigns) while maintaining its long-held post as rhetorical promoter of staunch fiscal discipline relative to sovereignty-encased “peripheral” states lacking full monetary and fiscal integration. In December 2011, the ECB made clear its intention to inject massive liquidity when faced with crises of scale in future. Already demonstratively disposed toward easing due to conditions on their respective domestic fronts, other major central banks have mobilized since the third quarter of 2011. The collective global central banking policy posture has thus become more homogenized, synchronized, and directionally clear than at any time since early 2009. This paper evaluates whether the 2011 national stability programs (SPs) of the euro area countries are instrumental in achieving economic stability in the European Monetary Union (EMU). In particular, we analyze how the SPs address the double challenge of public deficits and external imbalances. Our analysis rests, first, on the accounting identities of the public, private, and foreign financial balances; and second, on the consideration of all SPs at once rather than separately. We find that conclusions are optimistic regarding GDP growth and fiscal consolidation, while current account rebalancing is neglected. The current SPs reach these conclusions by assuming strong global export markets, entrenched current account imbalances within the EMU as well as the deterioration of private financial balances in the current account deficit countries. By means of our simulations we conclude, on the one hand, that the failure of favorable global macroeconomic developments to materialize may lead to the opposite of the desired stability by exacerbating imbalances in the euro area. On the other hand, given symmetric efforts at rebalancing, the simulation suggests that for surplus countries that reduce their current account, a more expansionary fiscal policy will likely be required to maintain growth rates. The American Jobs Act now before Congress relies largely on a policy of aggregate demand management, or “pump priming”: injecting demand into a frail economy in hopes of boosting growth and lowering unemployment. But this strategy, while beneficial in setting a floor beneath economic collapse, fails to produce and maintain full employment, while doing little to address income inequality. The alternative? Fiscal policy that directly targets unemployment by providing paid work to all those willing to do their part. Conventional wisdom contends that fiscal policy was of secondary importance to the economic recovery in the 1930s. The recovery is then connected to monetary policy that allowed non-sterilized gold inflows to increase the money supply. Often, this is shown by measuring the fiscal multipliers, and demonstrating that they were relatively small. This paper shows that problems with the conventional measures of fiscal multipliers in the 1930s may have created an incorrect consensus on the irrelevance of fiscal policy. The rehabilitation of fiscal policy is seen as a necessary step in the reinterpretation of the positive role of New Deal policies for the recovery. We present strong empirical evidence favoring the role of effective demand in the US economy, in the spirit of Keynes and Kalecki. Our inference comes from a statistically well-specified VAR model constructed on a quarterly basis from 1980 to 2008. US output is our variable of interest, and it depends (in our specification) on (1) the wage share, (2) OECD GDP, (3) taxes on corporate income, (4) other budget revenues, (5) credit, and the (6) interest rate. The first variable was included in order to know whether the economy under study is wage led or profit led. The second represents demand from abroad. The third and fourth make up total government expenditure and our arguments regarding these are based on Kalecki’s analysis of fiscal policy. The last two variables are analyzed in the context of Keynes’s monetary economics. Our results indicate that expansionary monetary, fiscal, and income policies favor higher aggregate demand in the United States. Scott Fullwiler and Senior Scholar L. Randall Wray review the roles of the Federal Reserve and the Treasury in the context of quantitative easing, and find that the financial crisis has highlighted the limited oversight of Congress and the limited transparency of the Fed. And since a Fed promise is ultimately a Treasury promise that carries the full faith and credit of the US government, the question is whether the Fed should be able to commit the public purse in times of national crisis. The US economy grew reasonably fast during the last quarter of 2010, and the general expectation is that satisfactory growth will continue in 2011–12. The expansion may, indeed, continue into 2013. But with large deficits in both the government and foreign sectors, satisfactory growth in the medium term cannot be achieved without a major, sustained increase in net export demand. This, of course, cannot happen without either a cut in the domestic absorption of US goods and services or a revaluation of the currencies of the major US trading partners. Our policy message is fairly simple, and one that events over the years have tended to vindicate. Most observers have argued for reductions in government borrowing, but few have pointed out the potential instabilities that could arise from a growth strategy based largely on private borrowing—as the recent financial crisis has shown. With the economy operating at far less than full employment, we think Americans will ultimately have to grit their teeth for some hair-raising deficit figures, but they should take heart in recent data showing record-low “core” CPI inflation—and the potential for export-led growth to begin reducing unemployment. This paper reconsiders fiscal policy effectiveness in light of the recent economic crisis. It examines the fiscal policy approach advocated by the economics profession today and the specific policy actions undertaken by the Bush and Obama administrations. An examination of the labor market renders the contemporary aggregate demand–management approach wholly inadequate for achieving certain macroeconomic objectives, such as the stabilization of investment and investor expectations, the generation and maintenance of full employment, and the equitable distribution of incomes. The paper reconsiders the policy effectiveness of alternative fiscal policy approaches, and argues that a policy that directly targets the labor demand gap (as opposed to the output gap) is far more effective in stabilizing employment, incomes, investment, and balance sheets. Beyond its original mission to “furnish an elastic currency” as lender of last resort and manager of the payments system, the Federal Reserve has always been responsible (along with the Treasury) for regulating and supervising member banks. After World War II, Congress directed the Fed to pursue a dual mandate, long interpreted to mean full employment with reasonable price stability. The Fed has been left to decide how to achieve these objectives, and it has over time come to view price stability as the more important of the two. In our view, the Fed’s focus on inflation fighting diverted its attention from its responsibility to regulate and supervise the financial sector, and its mandate to keep unemployment low. Its shift of priorities contributed to creation of the conditions that led to this crisis. Now in its third phase of responding to the crisis and the accompanying deep recession—so-called “quantitative easing 2,” or “QE2”—the Fed is currently in the process of purchasing $600 billion in Treasuries. Like its predecessor, QE1, QE2 is unlikely to seriously impact either of the Fed’s dual objectives, however, for the following reasons: (1) additional bank reserves do not enable greater bank lending; (2) the interest rate effects are likely to be small at best given the Fed’s tactical approach to QE2, while the private sector is attempting to deleverage at any rate, not borrow more; (3) purchases of Treasuries are simply an asset swap that reduce the maturity and liquidity of private sector assets but do not raise incomes of the private sector; and (4) given the reduced maturity of private sector Treasury portfolios, reduced net interest income could actually be mildly deflationary. The most fundamental shortcoming of QE—or, in fact, of using monetary policy in general to combat the recession—is that it only “works” if it somehow induces the private sector to spend more out of current income. A much more direct approach, particularly given much-needed deleveraging by the private sector, is to target growth in after tax incomes and job creation through appropriate and sufficiently large fiscal actions. Unfortunately, stimulus efforts to date have not met these criteria, and so have mostly kept the recession from being far worse rather than enabling a significant economic recovery. Finally, while there is identical risk to the federal government whether a bailout, a loan, or an asset purchase is undertaken by the Fed or the Treasury, there have been enormous, fundamental differences in democratic accountability for the two institutions when such actions have been taken since the crisis began. Public debates surrounding the wisdom of bailouts for the auto industry, or even continuing to provide benefits to the unemployed, never took place when it came to the Fed committing trillions of dollars to the financial system—even though, again, the federal government is “on the hook” in every instance. A common refrain heard from those trying to justify the results of the recent midterm elections is that the government’s fiscal stimulus to save the US economy from depression undermined growth, and that fiscal restraint is the key to economic expansion. Research Associate Marshall Auerback maintains that this refrain stems from a failure to understand a fundamental reality of bookkeeping—that when the government runs a surplus (deficit), the nongovernment sector runs a deficit (surplus). If the new GOP Congress led by Republicans and their Tea Party allies cuts government spending now, deficits will go higher, as growth slows, automatic stabilizers kick in, and tax revenues fall farther. And if extending the Bush tax cuts faces congressional gridlock, taxes will rise in 2011, further draining aggregate demand. Moreover, there are potential solvency issues for the United States if the debt ceiling is reached and Congress does not raise it. This chain of events potentially creates a new financial crisis and effectively forces the US government to default on its debt. The question is whether or not President Obama (and his economic advisers) will be enlightened enough to embrace this “teachable moment” about US main sector balances. Recent remarks to the press about deficit reduction suggest otherwise. With the global crisis, the policy stance around the world has been shaken by massive government and central bank efforts to prevent the meltdown of markets, banks, and the economy. Fiscal packages, in varied sizes, have been adopted throughout the world after years of proclaimed fiscal containment. This change in policy regime, though dubbed the “Keynesian moment,” is a “short-run fix” that reflects temporary acceptance of fiscal deficits at a time of political emergency, and contrasts with John Maynard Keynes’s long-run policy propositions. More important, it is doomed to be ineffective if the degree of tolerance of fiscal deficits is too low for full employment. Keynes’s view that outside the gold standard fiscal policies face real, not financial, constraints is illustrated by means of a simple flow-of-funds model. This shows that government deficits do not take financial resources from the private sector, and that demand for net financial savings by the private sector can be met by a rising trade surplus at the cost of reduced consumption, or by a rising government deficit financed by the monopoly supply of central bank credit. Fiscal deficits can thus be considered functional to the objective of supplying the private sector with a provision of financial wealth sufficient to restore demand. By contrast, tax hikes and/or spending cuts aimed at reducing the public deficit lower the available savings of the private sector, and, if adopted too soon, will force the adjustment by way of a reduction of demand and standard of living. This notion, however, is not applicable to the euro area, where constraints have been deliberately created that limit public deficits and the supply of central bank credit, thus introducing national solvency risks. This is a crucial flaw in the institutional structure of Euroland, where monetary sovereignty has been removed from all existing fiscal authorities. Absent a reassessment of its design, the euro area is facing a deflationary tendency that may further erode the economic welfare of the region. Did the New Deal Prolong or Worsen the Great Depression? Since the current recession began in December 2007, New Deal legislation and its effectiveness have been at the center of a lively debate in Washington. This paper emphasizes some key facts about two kinds of policy that were important during the Great Depression and have since become the focus of criticism by new New Deal critics: (1) regulatory and labor relations legislation, and (2) government spending and taxation. We argue that initiatives in these policy areas probably did not slow economic growth or worsen the unemployment problem from 1933 to 1939, as claimed by a number of economists in academic papers, in the popular press, and elsewhere. To substantiate our case, we cite some important economic benefits of New Deal–era laws in the two controversial policy areas noted above. In fact, we suggest that the New Deal provided effective medicine for the Depression, though fiscal policy was not sufficiently countercyclical to conquer mass unemployment and prevent the recession of 1937–38; 1933’s National Industrial Recovery Act was badly flawed and poorly administered, and the help provided by the National Labor Relations Act of 1935 came too late to have a big effect on the recovery. This paper presents the main features of the macroeconomic model being used at The Levy Economics Institute of Bard College, which has proven to be a useful tool in tracking the current financial and economic crisis. We investigate the connections of the model to the “New Cambridge” approach, and discuss other recent approaches to the evolution of financial balances for all sectors of the economy. We will finally show the effects of fiscal policy in the model, and its implications for the proposed fiscal stimulus on the US economy. We show that the New Cambridge hypothesis, which claimed that the private sector financial balance would be stable relative to income in the short run, does not hold for the short term in our model, but it does hold for the medium/long term. This implies that the major impact of the fiscal stimulus in the long run will be on the external imbalance, unless other measures are taken. In the face of the dramatic economic events of recent months and the inability of academics and policymakers to prevent them, the New Consensus Macroeconomics (NCM) model has been the subject of several criticisms. This paper considers one of the main criticisms lodged against the NCM model, namely, the absence of any essential role for the government and fiscal policy. Given the size of the public sector and the increasing role of fiscal policy in modern economies, this simplifying assumption of the NCM model is difficult to defend. This paper maintains that conventional arguments used to support this controversial assumption—including historical reasons, theoretical propositions, and practical issues—do not have solid foundations. There is, in fact, nothing inherently monetary in the stabilization policies found in the model. Thus, fiscal policy could play a role at least as important as monetary policy in the NCM model. Widespread economic recessions and protracted financial crises have been documented as setting back gender equality and other development goals in the past. In the midst of the current global crisis—often referred to as “the Great Recession”—there is grave concern that progress made in poverty reduction and women’s equality will be reversed. Indeed, for many developing countries it is particularly worrisome that, through no fault of their own, the global economic downturn has exacerbated effects from other crises manifest in food insecurity, poverty, and increasing inequality. This paper explores both well-known and less discussed paths of transmission through which crises affect women’s world of work and overall wellbeing. As demand for textile and agricultural exports decline, along with tourism, job losses are expected to rise in these female-intensive industries. In addition, the gendered nature of the world of work suggests that women will see an increase in their share among informal and vulnerable workers worldwide, and will also supply more of their labor under unpaid conditions. The latter is particularly important in the context of developing countries, where many production activities take place outside the strict boundaries of the market. The paper also makes this point: examined through the prism of gender equality, the ability of the state to implement countercyclical policies matters greatly. If policy responses at the national and international levels end up aggravating inequities, gender equality processes face many more barriers, especially among the poor.